Bobbis Sewing Blog Bobbis Sewing Blog - Learning to Sew & Loving It! September is National Sewing Month everyone! That means it’s time to go searching in attics, basements, and closets for those awesome sewing machines that will help you take your creativity to the next level! Take the sewing machines out of the boxes or take the gently used machines to the sewing machine store to get cleaned and checked. After that task has been accomplished you need to find a sewing teacher or class in your area and take a beginning sewing class. These classes will teach you how to operate your sewing machine as well as basic sewing techniques to get you started. Most beginning sewing classes will get you started making a pillow or even a pair of pajama bottoms. It’s ok if it doesn’t turn out perfect because it’s your first project! Just enjoy the class and the skills you are learning. Relax and have fun! Sewing is a great destressor! If you’re already a sewer, September is your month to shine! Try a new kind of sewing, sew some community service projects, or sew for a special little one in your life. Finish all those unfinished projects that you’re hiding in closets and under beds (I speak from experience). Or just choose a project for yourself and sew it! September is also a good month to join your sewing friends in a sewing organization. The American Sewing Guild has a great publication called “Notions” and has many chapters all across the country. Quilting Guilds also have chapters all over the globe and their meetings are full of learning, sewing, and just plain sewing bee style chatter. If needlearts are your would be passion look for a chapter of the Smocking Arts Guild of America.The nice part of many of these organizations is that if there is not a chapter in your area you can be a member-at-large. And as a member-at-large you will receive all the publications, be able to attend any seminars or conventions that the organization might have, and even start a chapter in your area! How cool is that? Sewing is a wonderful pastime and a lifelong learning skill. The joys of sewing allow an individual the freedom to express their personalities in the projects that they stitch. The need to be creative and express ourselves can come in many forms. Sewing is my form of personal expression and I hope it soon will be yours! My younger kids will be finishing up projects from the past few weeks before they start any new projects. 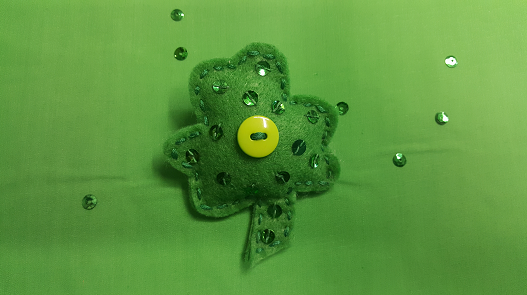 When they catch up they will be stitching a shamrock pin looking onward to St Paddy’s Day. We’ll be learning how to sew sequins on their pins as an embellishment. Then we’ll stitch them almost closed, add some stuffing, and then sew them up and add a pin closure to the back. They’ll have the luck of the Irish in March as they proudly wear their shamrock pins and tell everyone that they made them! 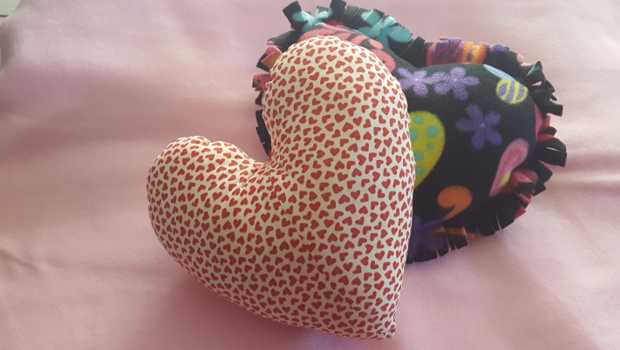 My older kids will be working on sewing heart pillows. More experience sewers will stitch a heart that has a 2-piece curved front. This is almost like sewing a dart that give a flat piece of fabric some curves and depth. We’ll be learning how to stitch these curves so that they will turn easily. My beginner kids will be stitching hearts made from fleece. We’ll be fringing these pillows which really makes them cute! Add a bow and I bet they’ll want to make more than one! Check out Ms. Bobbi’s Kits on my website for more information. By now my younger kids are getting the knack of basic stitches. We will be finishing our bracelets and starting some bookmarks. Short simple projects give them able time to practice basic hand sewing skills. I encourage the younger kids to take their time and keep on trying to master basic hand sewing skills. Easily frustrated at times, they need to understand that sewing is a learned skill that takes time to master. It’s not how many projects they finish but do they understand what they are doing? Beginning something is always a challenge. My older kids will be working on embellishment skills as they complete their Embellished Heart. We are starting to learn embellishment techniques that the kids can use to personalize all their projects. 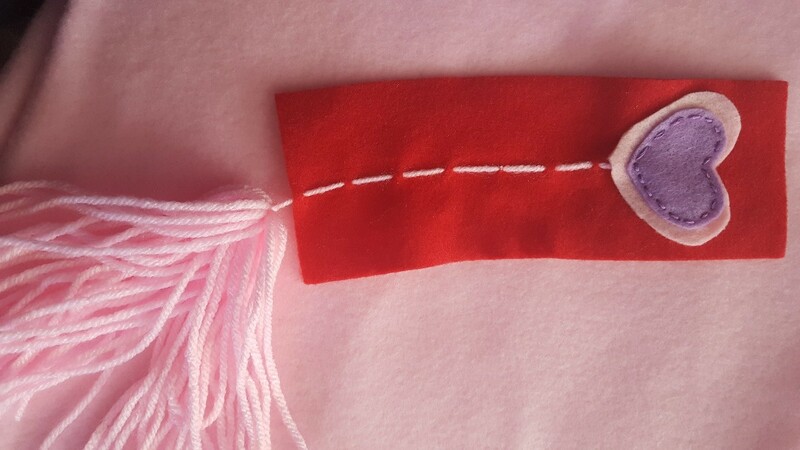 We’ll practice the techniques on a doodle cloth (a piece of felt) and then the kids will design a heart for a special person on Valentine’s Day. The end of January is here and I’m finally starting sewing classes with my students! I am thrilled to be back so let the sewing begin! This week is usually geared toward a review of basic sewing skills. The review also helps new students get started on their sewing journey. For the next 3 weeks our projects will have a Valentine theme. 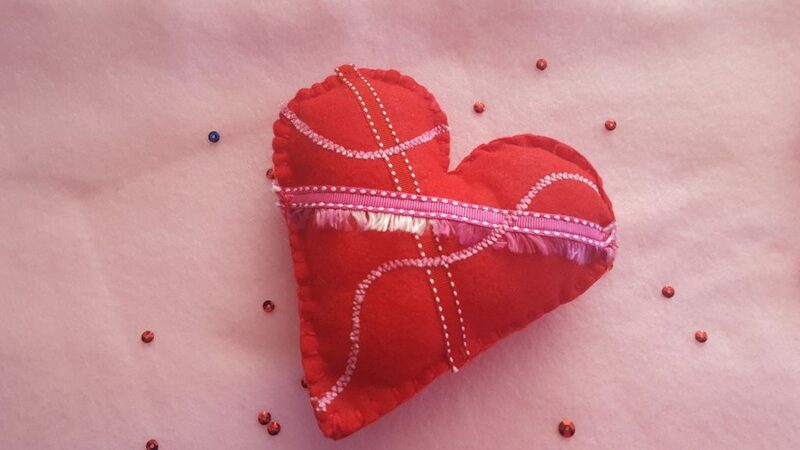 Hearts are perfect for teaching how to sew curves by hand or machine. 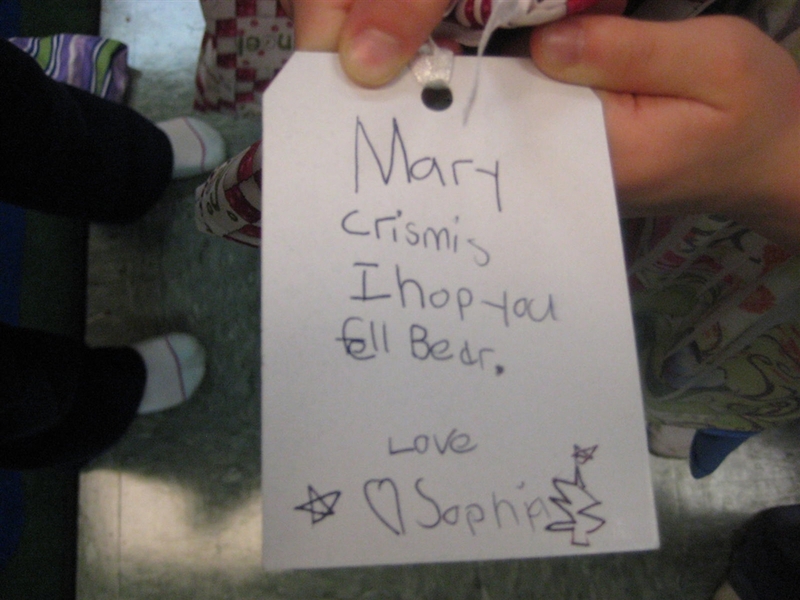 Decorating our hearts teaches elementary beading and sewing on sequins. My older classes will be decorating their hearts on the machine to learn techniques like couching or attaching lace. Everyone will love stitching projects to give that special person for Valentines Day or just for themselves! Just go to my website if you need more kits to stitch for gifts! 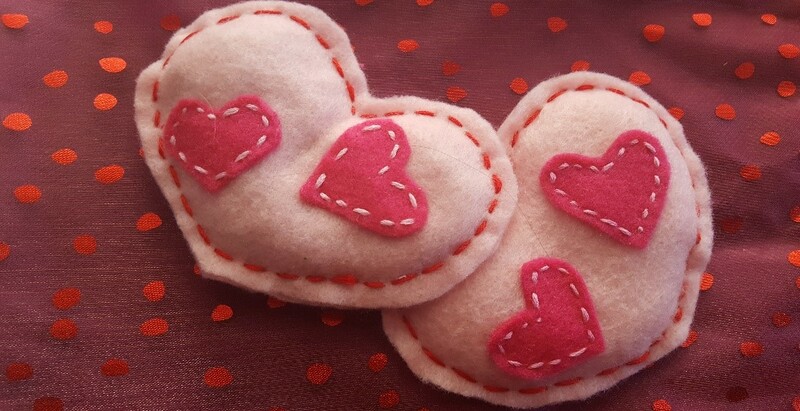 This week it’s Valentine Handwarmers. Hearts are filled with rice. Place them in the microwave for 20-30 seconds and drop them in a coat pocket or between the covers to warm up those fingers and/or toes! Enjoy!! Hello Friends! It’s been a busy month for me with getting ready for not only weekly classes but also putting final touches on my summer camps! Tower Hill Camp Fair is next week but I have my camps up right now on my website and the good news is that you can also register for camps at Tower Hill before anyone else sees them at the Camp Fair! “Sew” exciting! Please email me at bobbi@fascinationinfabrics.com or call me at 1-610-494-7742. And please share this blog! Thanks in advance! My camps for the summer are full of fun projects to test your child’s creativity and build both hand and sewing machine skills. They also foster a love of sewing and the needle arts! The following camps can be found in my brochure on my website or in Tower Hills brochure. I take care of the registration, so you may register for these camps on my site or by mail. 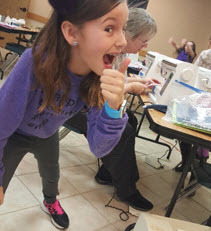 I have 2 general “Sewing on the Go” camp and each week has different projects geared to the interests and skills of the campers in the class. 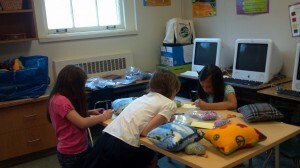 Back by popular demand, I’ve scheduled 2 “American Girl Sewing” Camps. Beginners will make a simple wardrobe for their dolls while learning to sew by hand and by machine. Advanced campers will love choosing several patterns to make clothes and accessories for their dolls while learning to navigate a pattern. Again, both weeks will focus on different projects depending on the skill levels of my campers. Always a favorite and full of fun creating monsters and creatures out of a variety of materials. I’ve had such wonderful classes with my young friends during the year, I decided to try a Junior Camp for kids 4-6-years old. This camp will be a morning only camp and will be mostly a hand sewing camp with stories and sewing crafts rounding out the morning. 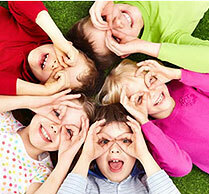 July 23 – July 27 During this week, I will be the guest teacher at the day camp. I’ll be doing beginning projects with both the Tower Tots (Minis) and the older kids. This is a great way to see if your kids would enjoy the wonderful world of sewing! Contact Ms. Cindy Sardo at csardo@towerhill.org with any questions. If you are going to Tatnall or are looking for other weeks for camp, I have 2 summer camps at Tatnall. The school takes care of their registrations so please contact Andrea Morrison andreamorrison@tatnall.org. 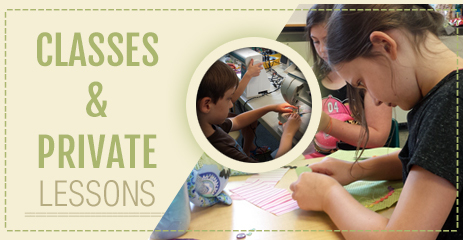 June 18 – June 22 August 6 – August 10 Learn basic hand and machine sewing skills while stitching lots of fun projects. Each week has a different set of projects to sew and projects are geared to the interests and skills of the campers in the class. I am getting so excited to start the Winter/Spring sessions with all of you! A welcome back to all my returning students and a welcome to all my new students at Tower Hill, Tatnall, and Ursuline Academy! 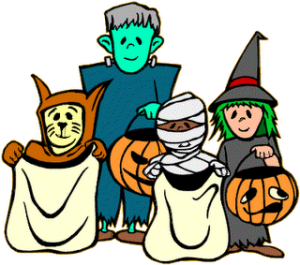 Usually, I try to write a newsletter each week to let parents know what we are doing in class and any remind them of any important dates like our parties we all love. This term I’m going to ask parents and kids to visit my blog each week on my website. All the blogs will be up on the site and you will never miss a weekly update. I’ll continue to post all the dates of the classes, keep you informed of any changes, and post pictures of our creations! And, if your kids enjoy the kits they can purchase additional kits on the website or through me at school. I’ll also be posting the blogs on my Facebook Page (Fascination in Fabrics). Please visit my page and “like” my page. Read some of the articles that I have posted or share your own article on sewing to my page. Anything sewing related would be fantastic and probably enjoyed by all. I’m “Sew” excited about my Website, Blog and Facebook Page! Come visit me soon and I’ll see you next week! And please share with anyone that might be interested in the joys of sewing! PS My summer camps are up on the website and are ready for kids to register! Sewing is a learned skill. I tell my young students this fact repeatedly as I guide them through my curriculum of projects that will give them the basics of sewing and the needlearts. As one learns to sew they must have the courage to tackle new techniques knowing that the first try might not be their best but knowing that is ok! Everyone, both kids and adults, must start at the beginning of their sewing journey. Everything they do while on that journey will be a first for them as they gain patience and determination to become better sewers. As they advance in their sewing adventure, they will get better! To quote President Obama “Yes we can!” And “Yes we will!” Case in point: Bobbi’s Zipper Phobia In the adult sewing world, most of the time inserting a zipper brings terror in the hearts of many! I was one of those people. In fact, even throughout my college years I always inserted a handpicked zipper to avoid having to use the machine! It wasn’t to get extra points from my sewing professors for going that extra mile and inserting a perfect (yes, after a while it was a perfect hand-picked zipper) hand-picked zipper. No, it was because to put in a machine zipper made me crazy. Being a perfectionist, I didn’t want to fail and have it look yucky! I didn’t realize why I became so confident in inserting a hand-picked zipper because I had done so many of them! I practiced that skill and it paid off! The machine zippers in my mind were forbidden territory because in my mind I made it forbidden. I was my own worst enemy. I psyched myself into believing that I could not do it. And for many years I did not!! Later in my sewing career I would master zippers and wonder why I had looked on it as such a hard technique to master. And now as a teacher, I want my young students to be able to be fearless when they must insert a zipper! (or any other technique for that matter!) This spring my projects for the kids include sewing different types of closures among them the infamous zipper! We will insert a simple zipper and build from there. We will make sure that we understand what we need to do and take it step by step. And before we begin I will quote them some words from my dear mentor and friend Martha Pullen who told us to keep assuring our students: “There is nothing that you can do in sewing that I cannot fix if something goes wrong. And if I can’t fix it I have extra materials and notions so that we can start over and try it again!” It’s totally always a win-win situation. Do not be afraid to try, just do it and enjoy the experience. My young students will be inserting lots of zippers and other closures into their projects this spring. I’m sure we will be successful because I will show them a positive attitude and be their biggest cheerleader! Their smiles at their accomplishments will be uplifting for me as we finish each new technique. Their success will be my success and continue to make me a better teacher. Learning to sew and loving it!